Addressing a rally at Jhabua in the state, Amit Shah observed that under Chief Minister Shivraj Singh Chouhan's government, people of the area could afford motorcycles. 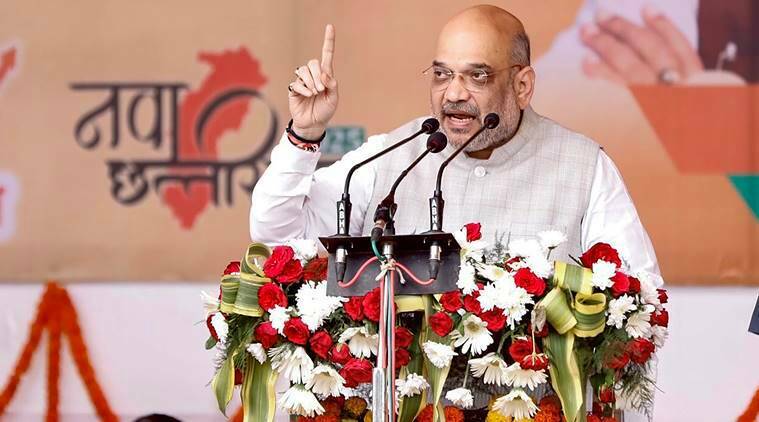 Claiming that the Congress did nothing for the tribal population, BJP president Amit Shah said in poll-bound Madhya Pradesh Saturday that his party had ensured that government funds reached the tribals and forest-dwellers. The Bharatiya Janata Party-ruled Madhya Pradesh will go to the polls on November 28, the Election Commission (EC) announced Saturday. Addressing a rally at Jhabua in the state, Shah observed that under Chief Minister Shivraj Singh Chouhan’s government, people of this area could now afford motorcycles. “The Congress will come, Rahul baba (Rahul Gandhi) will come. They will talk about everything, but development. They will talk about caste, religion. But whenever they come to power, they take money meant for the forest-dwellers to their own homes…The BJP ensures that the money meant for them reaches their (forest-dwellers’) homes,” Shah said. The Congress ruled Madhya Pradesh for 55 years, but development did not reach Jhabua, he added. “After getting off the helicopter, I was surprised to see that during Shivraj Singh Chouhan’s tenure, people are riding motorcycles,” Shah said. People in large numbers using two-wheelers meant that Chouhan had brought enough prosperity to the district, he added. “(During the Congress rule) There was not even a tribal ministry. When Atal Bihari Vajpayee became prime minister, the Adivasi Kalyan Mantralaya was formed for the first time,” the BJP president said. He attributed the saffron party’s victory in the 2014 Lok Sabha polls to support from tribals and forest-dwellers and added that in his first speech after becoming prime minister, Narendra Modi had made it clear that his government was for the poor, Dalits, tribals and forest-dwellers. “I want to ask (state Congress chief) Kamal Nath and company, how much money was allocated for tribals in their (Congress governments’) budgets? In all the BJP-ruled states, we have abided by the Constitution and increased the allocation for tribals, with the largest allocation for Madhya Pradesh,” Shah said.